Intrepid Bilderberg investigator and reporter Jim Tucker of the American Free Press (www.americanfreepress.net) confirms that U.S. Treasury Secretary Timothy Geithner will attend this year’s Bilderberg meeting in Athens, Greece. 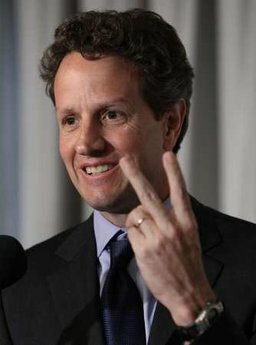 Geithner’s presence will be in violation of the Logan Act, intended to prohibit American citizens without authority from interfering in relations between the United States and foreign governments. Congress established the Logan Act in 1799. The only Logan Act indictment occurred in 1803. It involved a Kentucky newspaper article that argued for the formation in the western United States of a separate nation allied to France. No prosecution followed. Tucker told Alex Jones today that Geithner will attend the secretive meeting to talk about global government. Geithner recently announced while addressing the Council on Foreign Relations that he supported a proposal to replace the dollar as the world’s reserve currency with a composite of currencies that would be managed by the International Monetary Fund. Robert Zoellick was previously a managing director of Goldman Sachs, United States Deputy Secretary of State, and U.S. Trade Representative. He is a member of the Council on Foreign Relations and the Trilateral Commission and attended Bilderberg meetings in 1991, 2003, 2006 and 2007.